Dr. Jack Guenther has been in practice since 1990 (in Mokena since 1999), after graduation from the Illinois College of Optometry. At ICO he earned both his bachelors in Visual Science and his Doctor of Optometry degrees. He completed residency programs at Olympia Fields Hospital and at the Illinois Visually Handicapped Institute, along with two years employment at Rush Prudential - St. Luke's Hospital. Dr. Guenther is both DPA and TPA certified allowing him to diagnose ocular heath abnormalities and treat many diseases including Conjunctivitis, Keratoconus, Iritis and Glaucoma. He is able to fit many specialty contact lenses, examine children for visual/ocular problems, and co-manages LASIK and cataract patients with an Ophthalmologist. Please feel free to call Dr. Guenther or stop by the office at 19607 S. LaGrange Road to ask any questions you may have. 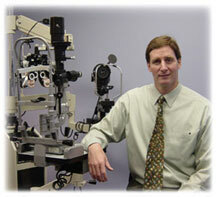 He is dedicated to offering the community quality care and experience for all of your visual/ocular health needs.